Recently, a company owner that uses our hosted Zimbra service asked me about tools her teams could use to improve sales and manage customer relationships more efficiently. After a few minutes of talking we realized that what she really needed was a way to follow up on sales and service messaging that would be quick, simple to use, and would help drive revenue. Easy. Zimbra’s webmail client already provides an effective solution to this business concern with a feature called Send Later. Just as you would expect, the Send Later email feature allows you to select the date and time for sending a message sometime in the future. It works for individual emails, group emails, and emails to distribution lists. This was an fantastic win for our client. Her staff is already comfortable working in the Zimbra webmail interface so there would be very little training required and no increase in her costs. I’ll outline just a few of the common use cases for Send Later. When composing an email inside Zimbra webmail you see the Send button with a little down arrow next to it. 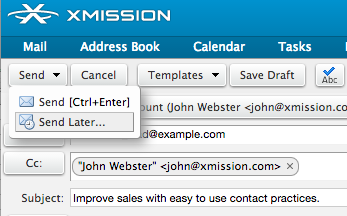 To use the Send Later feature you simply pull down the menu and select Send Later. Set the time and day to send then click OK. That is it. The message lives in your Drafts folder until it is sent by the system. Need to change something? No problem. You can edit your message by double clicking it in the folder. When done editing select Send Later to set the send time again as those details are not retained. Finally, I’ll share what I have found to be the single most important tip when using Send Later. Always CC or BCC yourself so that when the message sends you are aware of it and can follow up accordingly. In the example image I show CC but prefer to BCC myself so it is transparent to the receiver. As my special way to say thank you for reading this post when you follow this link to the XMission store I will give you 2 free months of new Zimbra service with the promo code “Zimbra2MO”. Note: During account creation you will need to enter a payment card but it will not be billed for 2 months. Hopefully you found this tip useful and will start using Send Later. This is one of my most commonly used features in Zimbra webmail. If there are any other subjects you would like to see covered in future posts please mention them in the comments below.